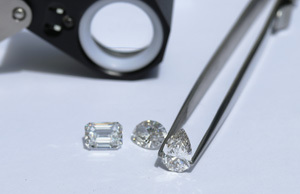 All of Ada's lab grown diamonds are hand-selected for quality, fire, and brilliance. This beautiful necklace features five conflict free, cultured baguette diamonds totaling 0.35ctw set in a 14kt yellow gold setting. Arrives on an 18" chain with a second loop to shorten to 16". Looking for a different size or price range? Our friendly Concierge team is happy to assist you in choosing a gorgeous round brilliant lab diamond in the size and price range of your preference. Additional options can be delivered in as little as two business days. Inquire today!